The E.U. 's copyright rules, adopted in 2001, are in need of an urgent overhaul. The Parliament's report, adopted with 445 votes to 65 with 32 abstentions on Thursday, assesses the implementation of the old law ahead of the Commission's upcoming proposal to modernize it. The Commission is scheduled to make proposals for a new European copyright law by the end of the year. Though the Commission has already said it was planning to address geoblocking, Günther Oettinger, Commissioner for Digital Economy and Society, has spoken out against a fast reform. He first wants to analyze how the film and TV industry would be affected. While the Parliament's report is a non-binding resolution, its adoption is seen as a precursor of the draft copyright laws that are likely to pass after they are presented by the Commission to the Parliament for approval. In the report, the Parliament called on the Commission to look for ways to improve access to online content across borders, "while recognizing the importance of territorial licences, particularly for TV and film productions." It stressed, however, that consumers are too often denied access to content and services on geographical grounds. It wants the Commission to propose adequate solutions for better cross-border accessibility of services and copyright content for consumers. Geoblocking practices should not prevent cultural minorities living in E.U. Member States from accessing existing content or services, it stressed. 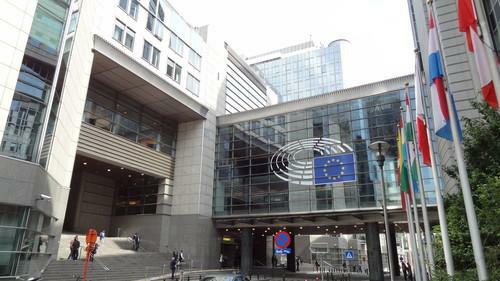 The Parliament also wants to make it easier for libraries to lend out e-books and digitize collections, something that is currently not included in the Commission's plans for a digital single market. Julia Reda, the Member of the European Parliament (MEP) who drafted the report, welcomed the instructions given to Commissioner Oettinger, but noted that many MEPs have yet to fully understand the cultural shift caused by the Internet and its consequences for copyright. "Much work remains until we have a European copyright framework fit for the digital age," she said. On Thursday, two controversial amendments to the report were rejected. One of them was an attempt from German conservative MEPs to call on the Commission to pave the way for an ancillary copyright for press publishers. Such a copyright would potentially force search engines like Google to pay for the republishing of news snippets. Another proposal, urging the Commission to restrict the right to use pictures of public buildings and sculptures, also didn't get approval. IT industry group DigitalEurope slammed the report for a lack of ambition. "As the Commission fleshes out its reform plans for copyright in the digital single market, the European Parliament appears to favor 'reform lite'," the group said in a news release. The tech industry, along with consumer and civil society groups, have long been pushing for the abolition of copyright levies on devices. Those levies are an outdated, inefficient, un-transparent tax on consumers born in the analog age and totally unfit for the digital environment, and the Reda report ignores calls for their abolition, DigitalEurope said. On Friday, the final version of the report was not yet available but a provisional version that is almost entirely the same as the adopted text can be found on the Parliament's website.